↑ 1.0 1.1 1.2 1.3 National Honey Board. 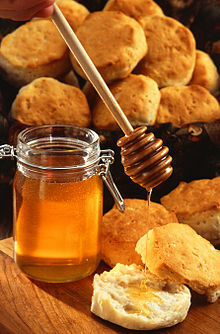 "Carbohydrates and the Sweetness of Honey". Last accessed 1 June 2012. ↑ Oregon State University. "What is the relative sweetness of different sugars and sugar substitutes?". Retrieved 1 June 2012. ↑ Shapiro, Roger L.; Hatheway,, Charles; Swerdflow,, David L. (1998). "Botulism in the United States: A Clinical and Epidemiologic Review". Annals of Internal Medicine. 129 (3): 221–8. doi:10.1059/0003-4819-129-3-199808010-00011. PMID 9696731. ↑ 5.0 5.1 Questions Most Frequently Asked About Sugar (PDF). American Sugar Alliance. ↑ USDA Nutrient Data Laboratory "Honey." Last accessed 24 August 2007. ↑ Beesource Beekeeping » Honey Composition and Properties. Beesource.com. Retrieved on 6 February 2011. ↑ Gov.au/reports. None. Retrieved on 9 January 2012. ↑ Rainer Krell, (1996). Value-Added Products from Beekeeping (Fao Agricultural Services Bulletin). Food & Agriculture Organization of the UN. ISBN 92-5-103819-8. หน้านี้แก้ไขล่าสุดเมื่อวันที่ 9 ธันวาคม 2561 เวลา 06:59 น.